Universal Tool Air Scribe/Engraving Chisel Kit provides sufficient power for engraving and mini chipping applications and features a high precision throttle that ensures critical control. 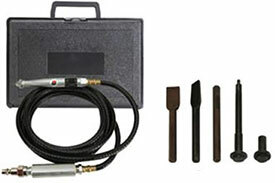 Universal Tool Air Scribe/Engraving Chisel Kit is complete with stylus, flat, round and chisel blanks, air hose ad filter connection and are best suited for precision engraving of metals, stone and marble. The UT8617K Universal Tool Air Scribe/Engraving Chisel Kit is one of thousands of quality tooling products available from MRO Tools. Please browse Universal Tool Air Scribes and Engraving Chisels for tools similar to the UT8617K Universal Tool Air Scribe/Engraving Chisel Kit. UT8617K Universal Tool Air Scribe/Engraving Chisel Kit description summary: Universal Tool Air Scribe/Engraving Chisel Kit. Retainer: Screw Housing Material: Aluminum Bushing(in): 1/8'' Blows Per Minute: 13,500 Bore(in): 0.228'' Stroke(in): 0.323'' Weight: 0.30lbs/0.1kg Length: 5.00''/127mm Air Inlet(NPT): 1/4'' Hose ID: 3/16'' Quantity discounts may be available for the UT8617K Universal Tool Air Scribe/Engraving Chisel Kit. Please contact MRO Tools for details.